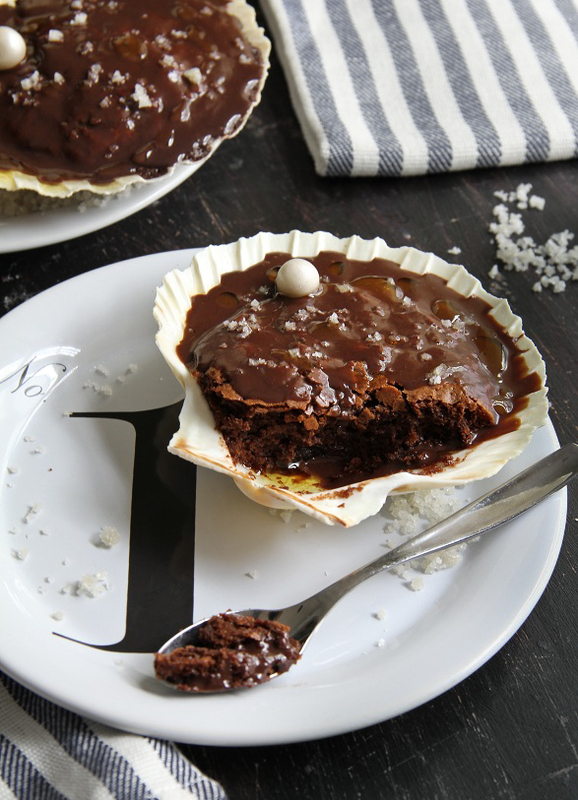 One evening many months ago, as I was enjoying savory risotto baked in a scallop shell, I wondered - has anyone ever baked dessert in a scallop shell? I was instantly struck with the desire to try, but I wasn't sure how to execute such a thing. I looked online. I googled "dessert baked in scallop shell" with no luck at all. Thereafter I searched high and low for some kind of direction, or at least an indication that someone else had tried this idea and it had worked. It wasn't until I came across the recipe for gâteau au chocolat (chocolate cake) with sea salt, that I had the notion to try again. Once more I googled, I searched. Still nothing! 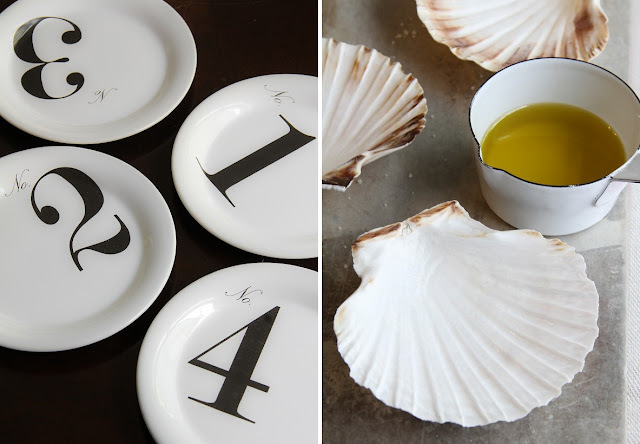 I finally reasoned that the scallop shell was nothing more than nature's ceramic dish and theoretically, it should work. I can't account for other batters, but this nearly flourless cake baked up perfectly in about 15 minutes at 400 degrees. The cake recipe is by French Basque chef Inaki Aizpitarte who is owner of the fashionable Le Chateaubriand in Paris. He is most well known for his unconventional food pairings. Sea salt and olive oil may seem strange company for chocolate cake, but after one bite I'm willing to bet you'll be hooked. It is delicious! I made a small addition to this recipe; a rich, 5 minute chocolate sauce to spoon over the cakes. It keeps the cake moist and adds extra richness that a small dessert can afford. Use good quality extra virgin olive oil for drizzling over the cakes. The best variety for sweets will have bright, fruity notes. The shells will need to be balanced on a bed of sea salt while baking so the cakes don't tip over at the heavy end. I also like to serve them this way on a pretty plate. I think these would be so much fun at a beach-themed party or mermaid birthday - or even at the end of a fancy dinner. They are most certainly elegant and a lot of fun make. Preheat oven to 400 degrees F. Rinse and dry scallop shells. 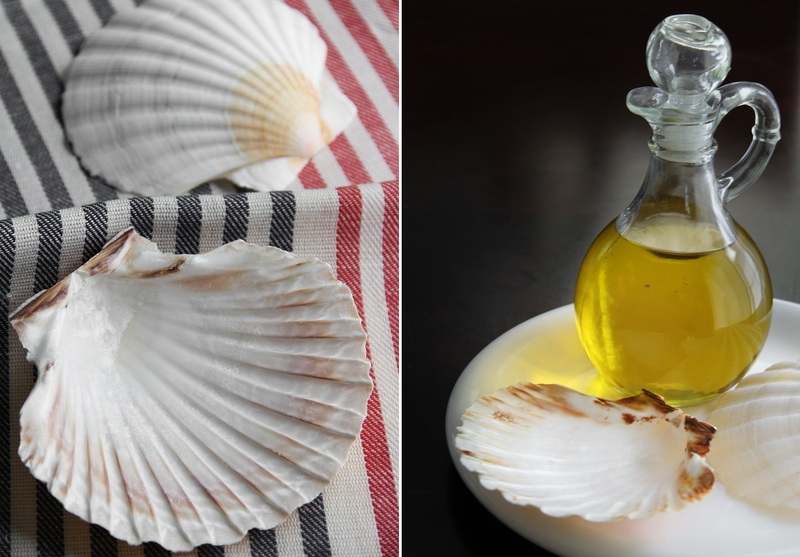 Brush the entire bowl of each shell with olive oil; set aside. Place mounds of sea salt, widely spaced, on a large jelly roll pan. 5-6 shells can fit on a large jelly roll pan. Set aside. 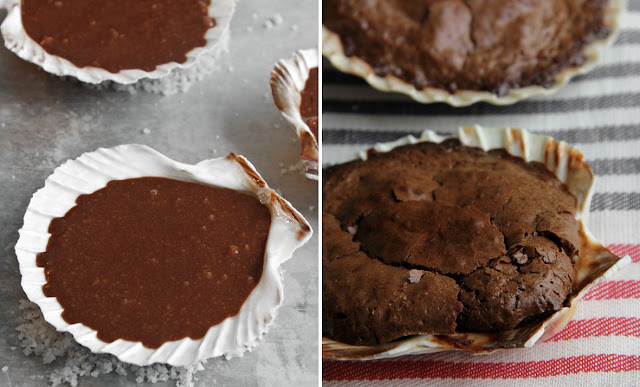 Melt chocolate in a heat proof bowl over a pan of simmering water. Add butter and stir until butter is melted and well combined with the chocolate. Remove bowl from simmering water and let stand until later needed. In the bowl of a stand mixer, combine the eggs and sugar together and mix on high speed until mixture turns pale and doubles in volume. Decrease mixer speed and add the flour a little at a time, then the baking powder. While mixer is running, pour the chocolate mixture in a thin stream into the egg and sugar mixture. Mix until well blended. Fill each shell with 1/4 cup of batter. If your shells are smaller than 5", just be sure they are no more than 2/3 full. Balance shells on the mounds of sea salt in the jelly roll pan, making sure each one is flat to ensure they don't bake lop-sided. Bake for 11-15 minutes. When cakes are done, they will form a brownie-like crust on top and a toothpick tester should come out clean. In a medium saucepan, stir together cream, half and half, sugar and butter. Place pan over medium-high heat and stir to dissolve the sugar and melt butter. When sugar and butter has melted, add chocolate and whisk until melted and smooth. Add vanilla extract and whisk again. Remove from heat. Let the mixture stand for a few minutes and then whisk again. Pinch off small pieces of white fondant and roll each piece into a small pearl-sized ball between hands. Brush candy pearl with luster dust. Spoon a small amount of chocolate sauce over each cake, smoothing it to the edges with the back of a spoon. 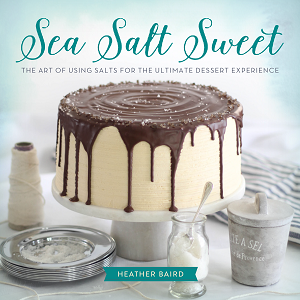 Lightly sprinkle cakes with sea salt (don't use a heavy hand with this if using coarse salt). Drizzle cakes with olive oil. 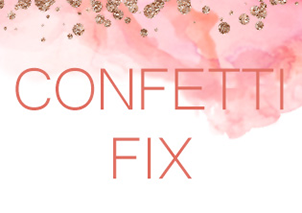 Add candy pearl and serve to delighted guests. If you want to bake the cake in a normal cake pan, pour batter in a 9" round tin and bake at 400 degreesF. for 30-40 minutes. The original recipe can be found in the cookbook Nobody does it Better: Why French Home Cooking is still the Best in the World. Be sure to save your shells for next time! They are washable and 100% reusable. What a fantastic summer dessert! I just love it... so pretty too. What a brilliant idea when factoring in the sea salt! 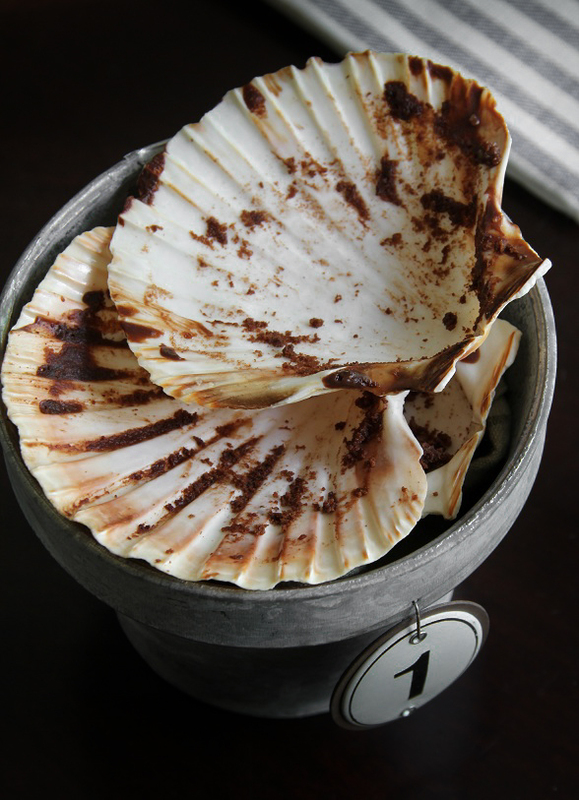 Love a little savory with sweet, and the olive oil and chocolate sauce just puts it on a level that's beyond 'dessert' It's like opening a real scallop shell, with the oil and sauce, then the 'gem'. Beautifully done, beautiful photos! Such a ingenious idea! The pictures are awesome and make me want ot go to the beach! Heather, these are gorgeous! The olive oil and sea salt sounds so interesting. That's unusual, but it certainly looks amazing! 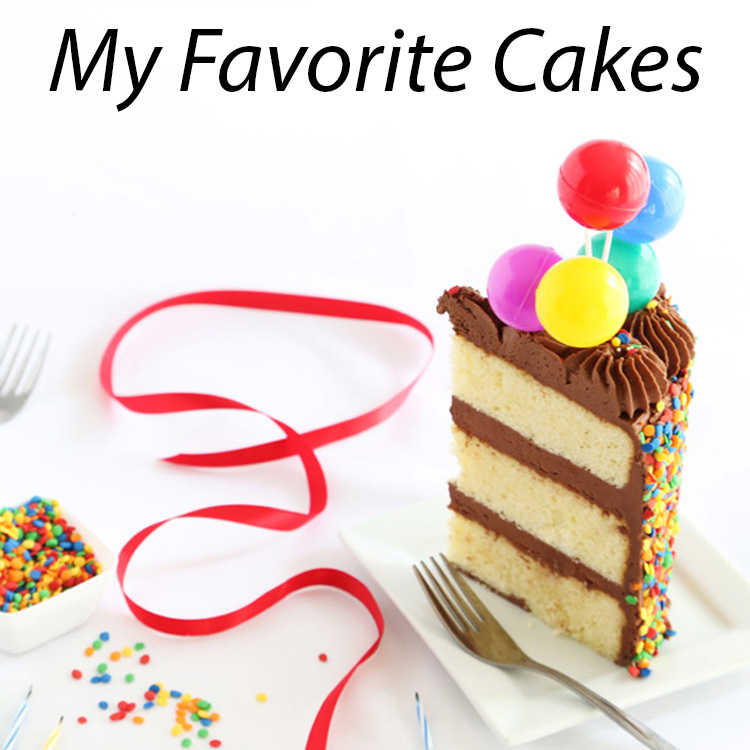 Beautiful and delicious - such moist little cakes! Lovely! this is so cute! love the salt and the shells. wish it was warm enough for the beach! Oh goodness, what a completely gorgeous and totally delicious sounding dessert. These are so fabulous! And the pearls!? Gah! What an innovative and creative way to serve a delicious looking dessert. That *pearl* was the perfect finishing touch! wow this is such a creative idea, they look great! I love how you've tied the two ideas together with the sea salt and the pearl for decoration. Brilliant! Beautiful idea! Especially with the use of sea salt. And I love the pearl. I can just picture this at a lovely seaside picnic...I would love to be at that party! GENIUS! I'm going to keep this in mind for Mother's day next year - my mom is a total seashell lover. Also, I love your number plates - need, need, need! Mmmhhh, devilishly chocolaty and rich! I love the presentation. 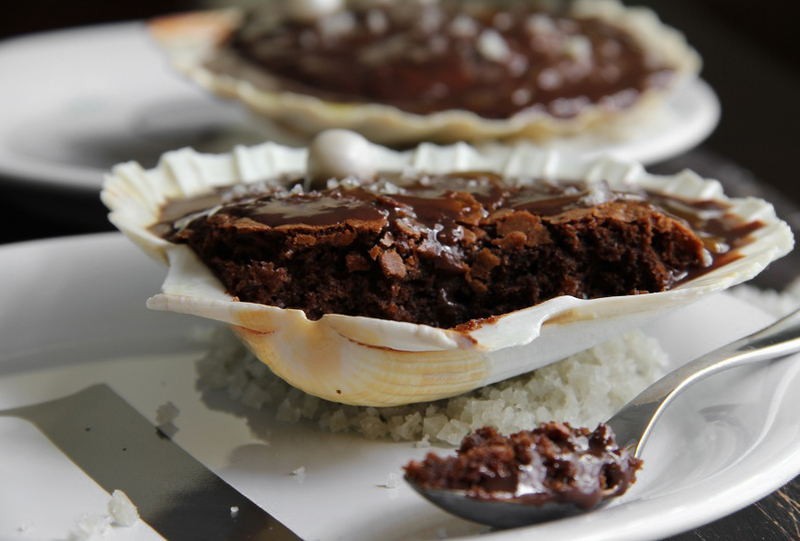 wauu..amazing idea with shells and sea salt..I love it♥..
That is such a gorgeous way to serve a dessert! I'd eat that chocolate cake out of anything because it looks amazing. Es una verdadera exquisitez. Siempre me ha gustado el chocolate con el toque de aceite de oliva y sal. De peueña en la merienda nos lo daban muchas veces. Just stunning! You never fail to amaze me with your twists on classic as well as wow with your originality. Just genius! 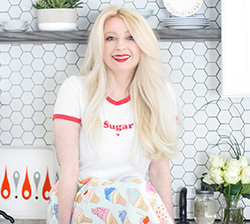 I can't wait for your cookbook! This is brilliant. Wonderful idea - and it sounds amazing too! What! No Pink? But, I LOVE it. How creative and innovative you are. 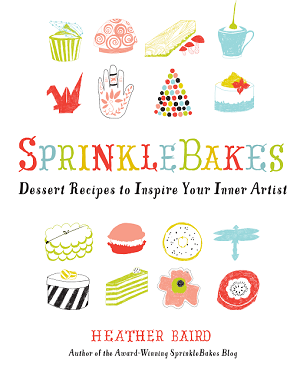 Your artistic background just shines through this elegant dessert. I could imagine them dressed down for a casual beachy theme too. Love the pearl on top...that is the crowning touch! What a great idea ( as usual with you), my daughter wants a mermaid party, how cool would it be! Thanks for sharing!! As usual, these are gorgeous. Such a creative idea, and I love how you served them on a bed of sea salt. 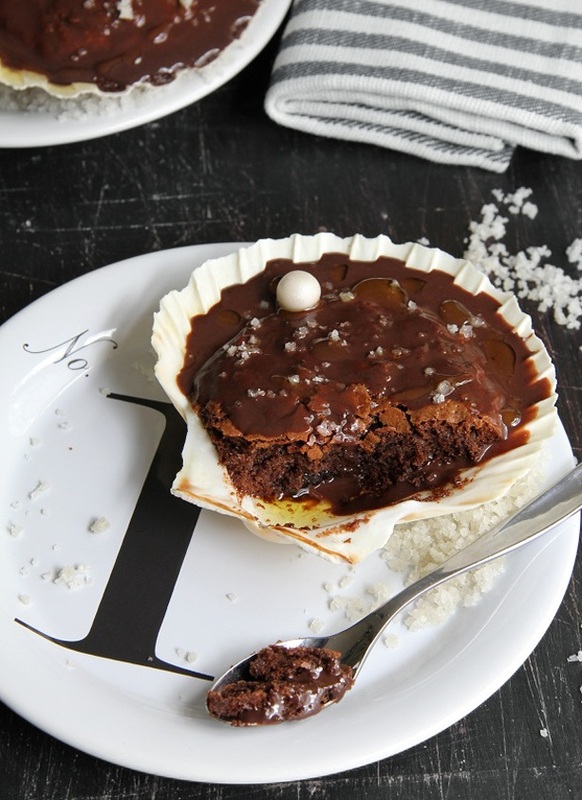 Olive oil + sea salt + chocolate sounds like a great flavor combination! This is such a fantastic idea! I'm sure we'll see a mass wave of chefs doing this now. So original! Putting it in a sea shell was so cute! Looks yummy! You come up with the best ideas ever! Brilliant, as a guest I would be in love with the baker! What a super idea heather. This is gorgeous! What a lovely idea! A beautiful dessert fit for a mermaid. I found your blog last night by clicking on some link on tweeter, and i've been reading it for hours now ! I've just realized this recipe's taken from a french cookbook, but it reminds me of chocolates i bought last summer in Italy : gianduja with olive oil and salt, the best chocolates i ever tasted in my life... I think i'm going to make this chocolate cake this week because my eyes just won't stop staring at the pictures, i'm gonna be obsessed with this chocolate sauce until i've tasted it ! this is such a great idea! where did you get the scalloped shells? What a beautiful dessert! Ok, I'm not a sea food girl. Promise there's no "flavor" left over? Love you and thinking of you often. Did I send you that tiny treat the girls and I picked up for you? or if not I guess the envelope is somewhere in my car??? Hi Jenna! I got my shells at a local kitchen specialty store. I've linked a couple of places in the recipe text above where you can find them for purchase online. This looks out of this world! Anything with chocolate and sea salt makes my mouth water! Oh my goodness! I'm pinning this so I can make it for my 52 Cakes project. I love that you baked such a luscious sounding cake in shells. Brilliant! Thanks for popping by my blog - the pesto bread is amazing. I think it's my new take to a casual party recipe. oh this is just fabulous for summer dinner. i live on cape cod, so we have these shells! Beautiful, beautiful, beautiful! As always, beautiful! You are so innovative, Heather! This idea would never even enter my mind. Besides looking elegant in the shell, the cake looks so rich and delicious, especially with the sauce:) Where did you get the numbered plates~love them! What a beautiful and genius idea! I LOVE THIS! I participate in cooking contestss and this is the perfect presentation to send my submissions over the top. 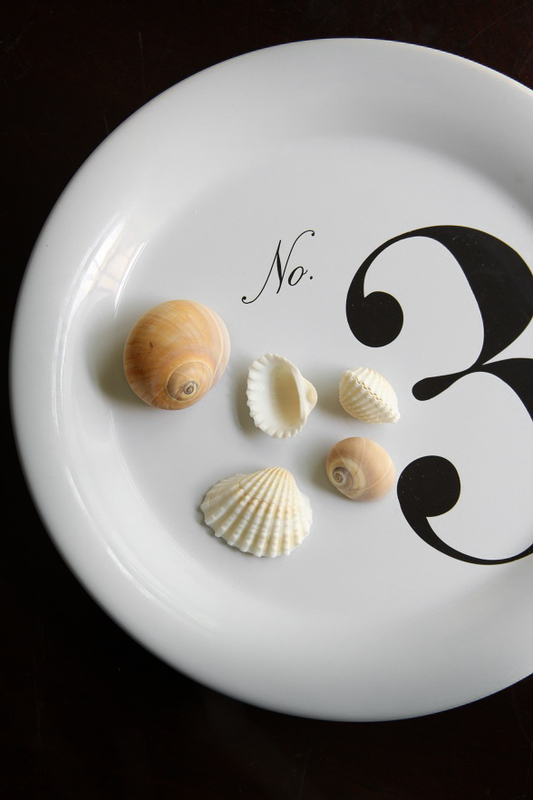 Plus it is a great way to utilize some large shells I already have in my home. LOVE THIS!!! Such a cool idea. I've had olive oil and sea salt chocolate bars before, so I know it's an amazing combo. You have the best ideas!! What a brilliant idea! I'm having so much fun looking at older posts. Girl, you've got talent. Love it! I LOVE this idea! I recently got some Himalayan pink saltfrom Sustainable Sourcing https://secure.sustainablesourcing.com and I'll have to try it out in this recipe. My next dinner now has a dessert! This is just beautiful! I love the idea and presentation. Also, I absolutely adore sea salt and olive oil in desserts. Fabulous. Ha, "nature's ceramic dish" indeed! How clever! I can't wait to try this. Wow! I would have never thought about baking in a shell in a million years. Way to use your noggin! These look so delicious! I am feeling guilty just by looking at it! This is just beautiful. The dessert sounds lovely. I love the addition of sea salt and olive oil in sweets. what an awesome idea. love it. i also love your number dishes. where did you get them? keep up the good work.